As the night’s draw out and warmer weather beckons, our attention turns to the garden. Lawns and borders certainly need attention, but so too do hard landscaped areas. Moisture and bacteria can lead to moss and algae build-up, discolouring surfaces and making them slippery. Fallen leaves and other dirt and debris will also stain slabs, and a combination of rain, frost and UV will fade darker surfaces. The best way to remove dirt and slippery residues is to use a specialist paving cleaner. It’s generally best to avoid acid-based products, as these can etch stone and eat away at grout. 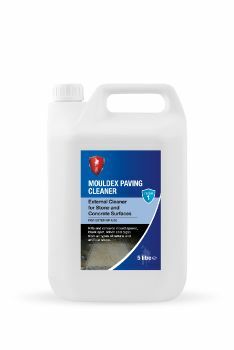 A viscose-type product, like LTP Mouldex Paving Cleaner, will cling to the surface (rather than running off into beds and borders) and will help remove mould stains caused by mould spores, black spot, lichen, fungus and algae. It will also help restore the surface to its original colour. Once clean, it’s worth protecting the slabs with a sealer – especially if you have a stone surface that continues indoors and you want to maintain a seamless aesthestic. Look out for a modern, water-based treatment, like LTP External Stone Sealer, which can be applied in damp weather; it will protect against stains and the elements, and will provide a more convenient (and safer) alternative to a spirit-based product. Two new products are joining our British-made LTP range this year, to help restore hard landscaped areas. 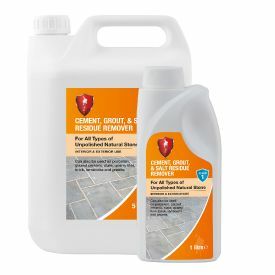 New ‘Cement, Grout & Salt Residue Remover’ removes grout and building residues, as well as salt marks caused by rising damp and an installation method called ‘spot fixing’. This new Remover replaces conventional acid, which would normally be used for the job, so it can safely be used on all types of tile and stone – indoors and outside – except those with a polished finish. Notably, it can be used on unpolished acid-sensitive surfaces, including limestone and travertine, without any risk of etching. The second new treatment – LTP Blackstone – is an outdoor impregnating sealer and restorer that restores the appearance of faded dark limestone, marble, slate, concrete and artificial stone surfaces. 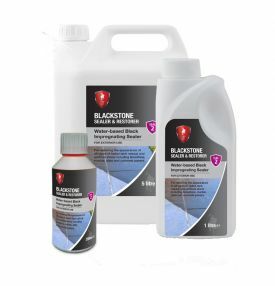 Blackstone is water-based, so it’s safe and convenient to apply, and it provides further protection against the elements. It’s applied in multiple coats until the desired colour effect is achieved – from dark grey to ebony – and it can also be used to restore stone fireplace hearths.